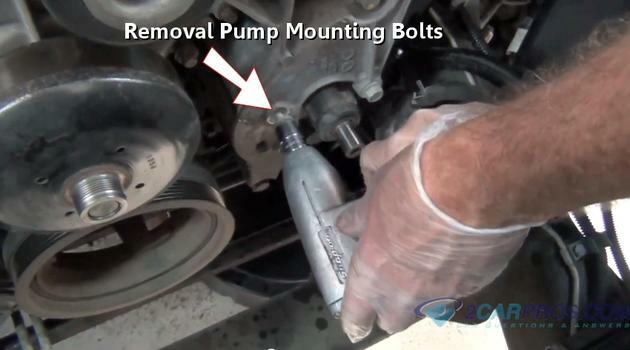 Step by step guide on how to replace an automotive power steering pump, this articles pertains to most vehicles though configurations may be slightly different depending on application. 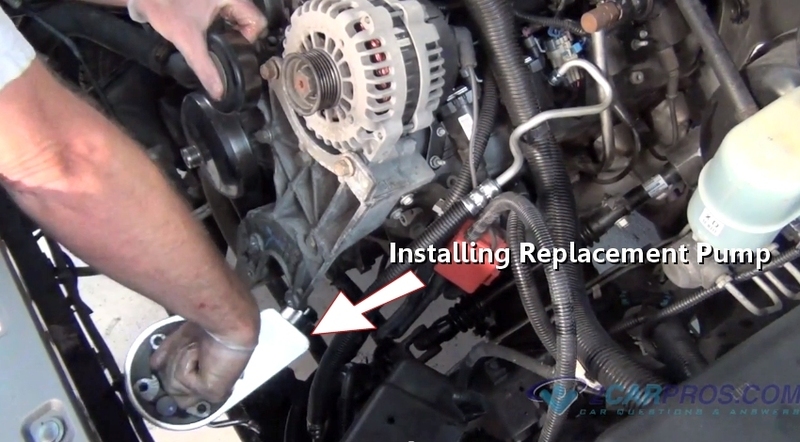 Before replacing a power steering pump make sure you have diagnosed the problem properly. There are two components involved in the power steering system, the power steering pump and the power steering gear box or rack and pinion. 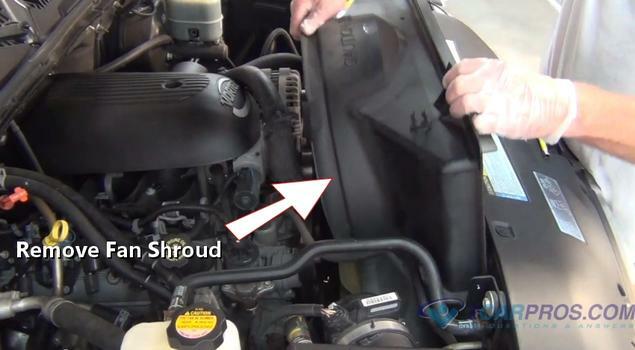 Always check the power steering fluid level with the engine off. 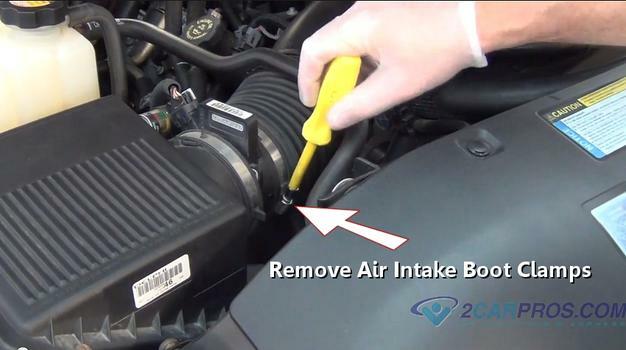 Flush the system completely with new fluid on a regular basis to ensure longevity of the system. Running a hydraulic pump without fluid can permanently damage the unit. 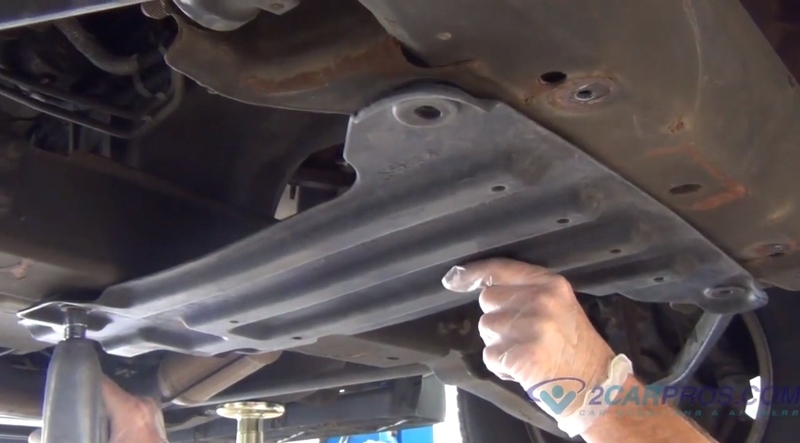 Inspect the power steering fittings, hoses, reservoir, cooler and pump for leaks. 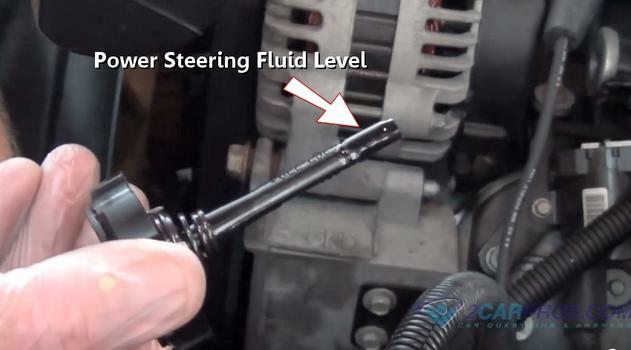 The power steering pump of a vehicle supplies hydraulic pressure to the power steering box or rack via the power from the engine. This pressure is then transferred through the high pressure hose and then fluid returns to the pump through the low pressure hose. 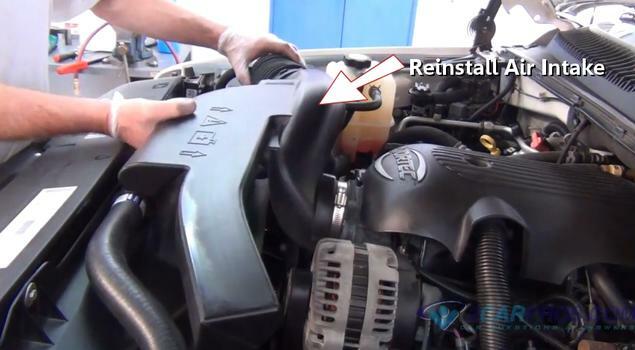 This system re-circulates its fluid continuously, and when the pump fails it can make a moaning noise or make the car difficult to steer. 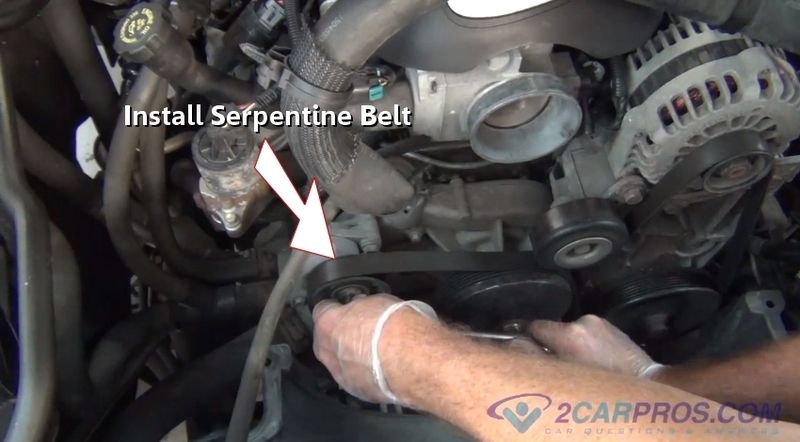 Inspect the serpentine belt when replacing the power steering pump. 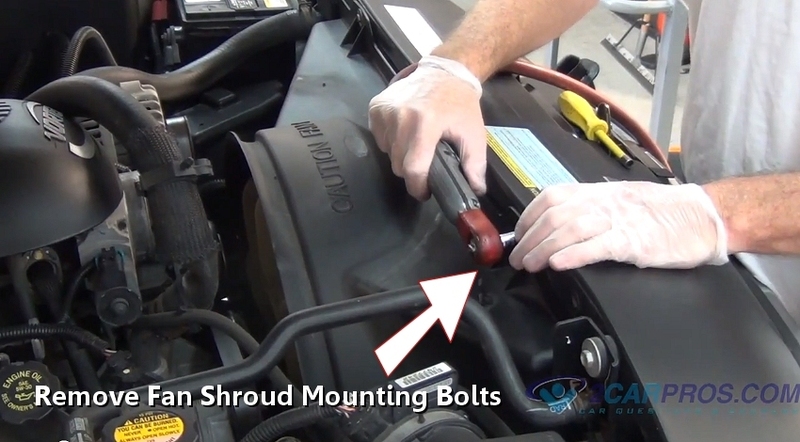 Make sure all mounting hardware is tight to the engine block or cylinder head. Never use a hammer to install or remove pulley or damage will occur. 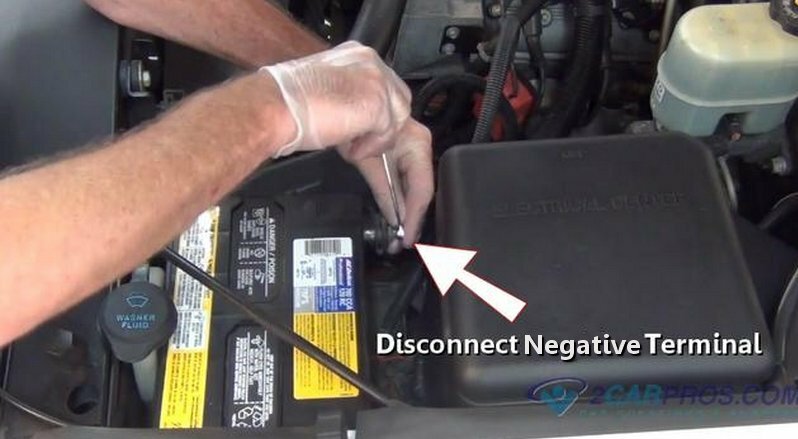 Step 1 - Once the vehicle is safely positioned, open the hood and remove the negative battery cable, this will avoid a short circuit while performing repairs. 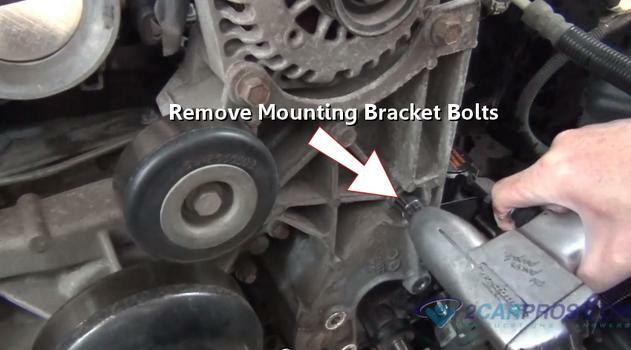 Step 2 - Loosen all fasteners and clamps to help remove the air intake and adjoining tubes. 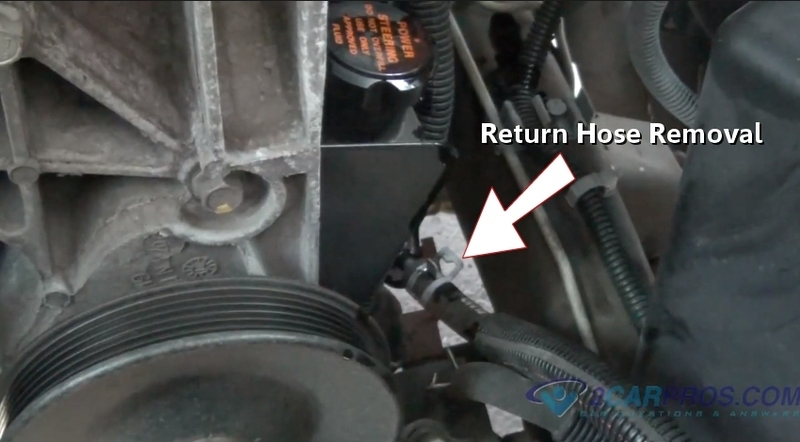 Step 3 - After all fasteners and clamps are removed or loosened, grasp the air intake and remove it from the engine bay. Step 4 - Once the air intake has been removed loosen and remove the fan shroud mounting bolts. 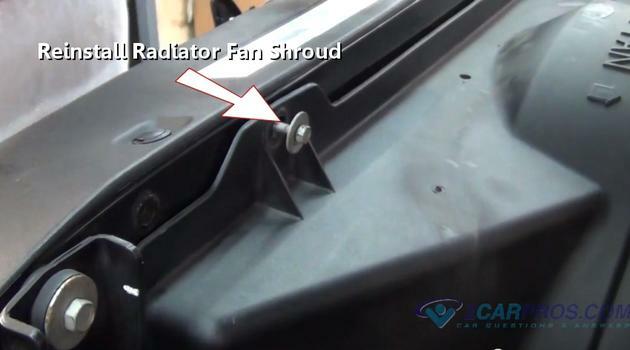 Step 5 - Next, lift gently upward on the fan shroud being mindful not to damage the radiator. 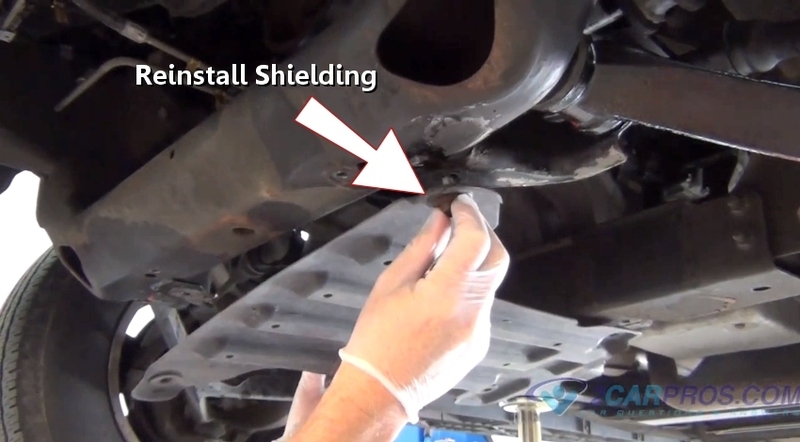 Step 8 - Next, remove any under vehicle shielding that will retain fluid once the pump has been removed. 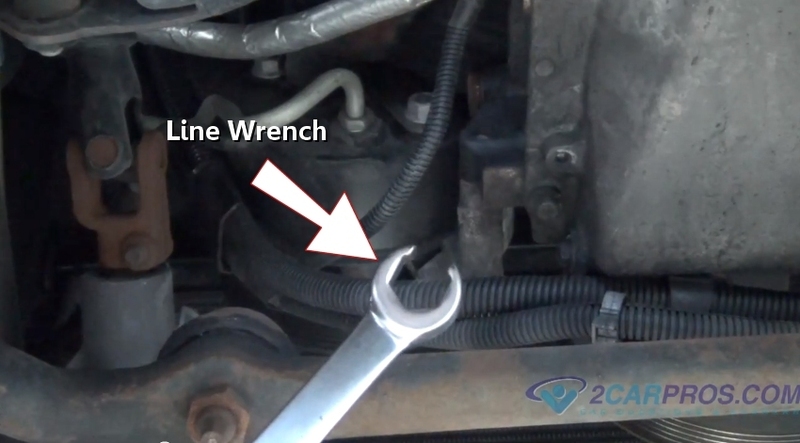 Step 9 - For the next step a line wrench is needed to prevent damage to the high pressure power steering hose. 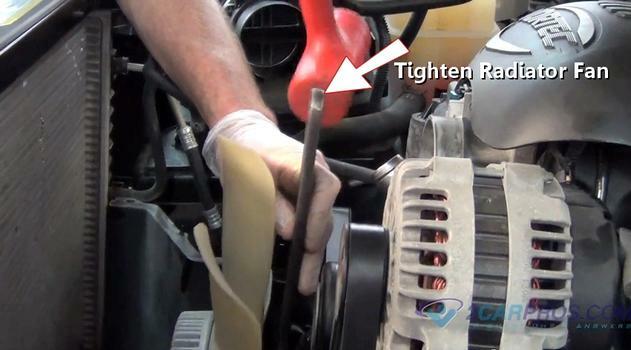 Step 11 - Once the high pressure line has been removed, use channel locks to remove the return hose line. 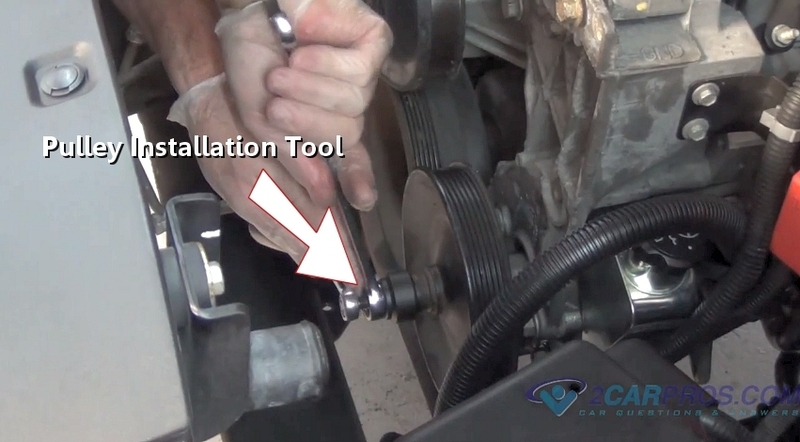 Step 12 - Next, assemble the power steering pulley removal tool. The tool featured was made by stinger and was successful in removing the pulley with a hose clamp around the tool. Continue to tighten the tool until the pulley has been removed. 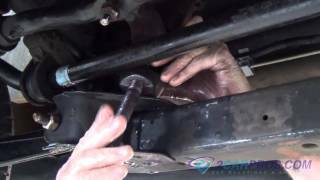 Step 13 - After the pulley has been removed, loosen and remove all pump housing mounting bolts including rear mounted bolts. 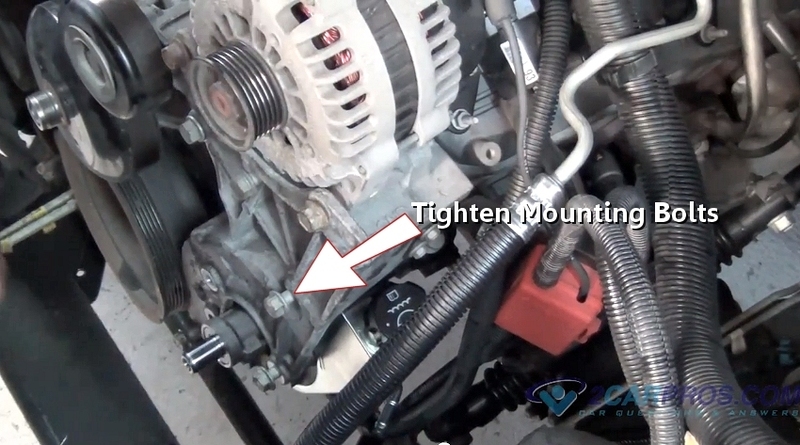 Step 14 - On some models, the main mounting bracket will need to be loosened to finish removing the pump assembly. Step 15 - Once the bracket has been loosened the pump can be removed from the engine bay. 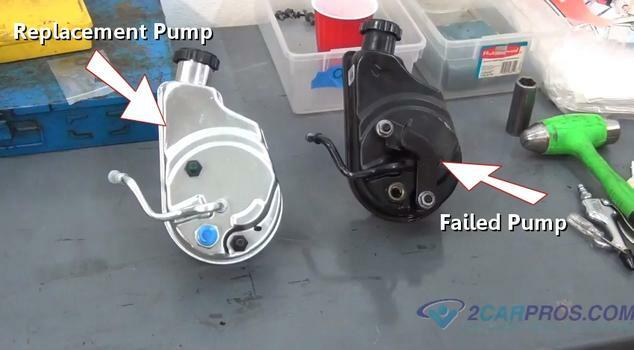 Match the failed pump against the replacement pump and transfer any mounting brackets. Step 16 - After the pump mounting brackets have been transferred from the failed pump to the new unit position the new pump for mounting. Step 17 - Then, install and tighten all pump and mounting bracket bolts, including rear facing bolts. 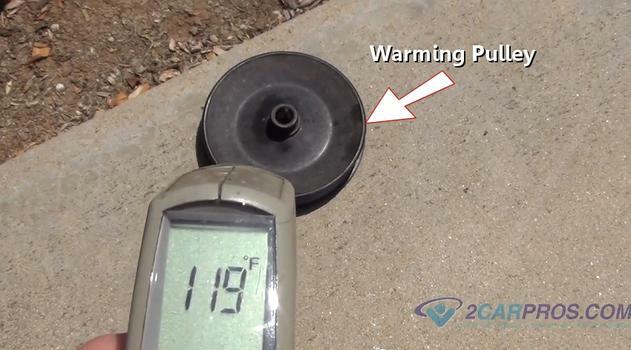 Step 19 - When reinstalling the pulley onto the pump shaft, it helps to warm the pulley either in the sun or in a oven to expand the metal. 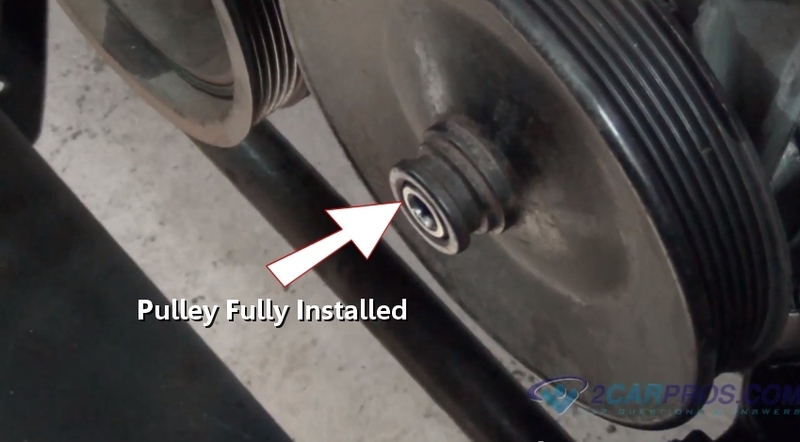 Step 20 - After the pulley has been warmed, gently press the pulley onto the pump input shaft. 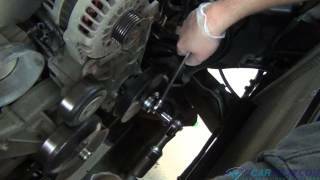 Step 21 - Continue to install the power steering pulley until the pulley is flush with the end of the output shaft. 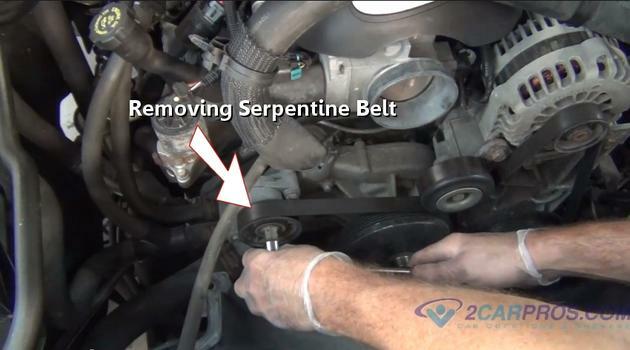 Step 22 - Once the pulley has been fully installed, route the serpentine belt into place by releasing the belt tensioner. 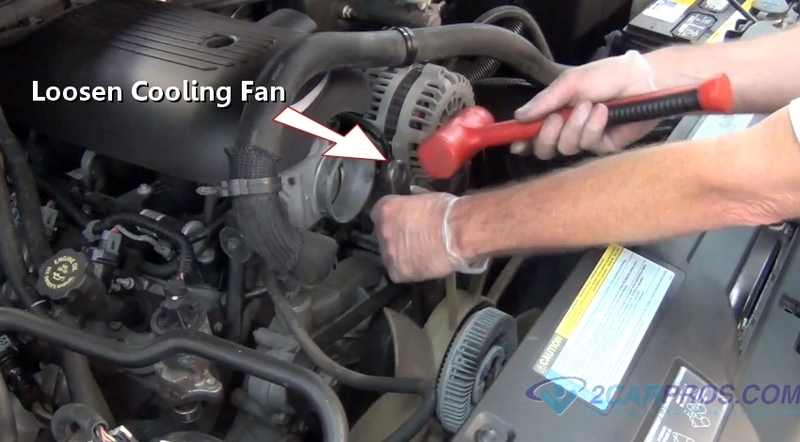 Step 24 - Then, tighten the radiator fan onto the water pump by using a hammer and wrench. 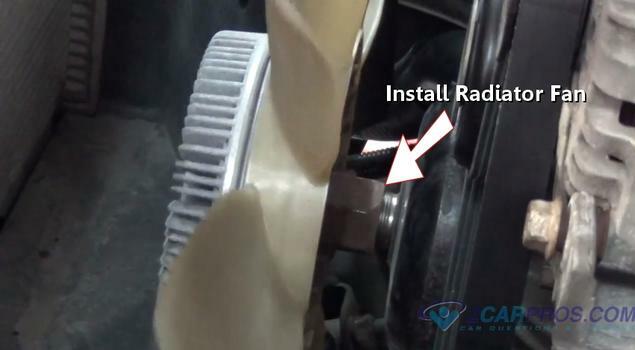 Step 25 - Once the radiator fan has been re-installed and tightened, install both upper and lower radiator fan shroud pieces, install and tighten retainer bolts. Step 26 - After the fan shroud re-installation is complete, install the air intake and tighten. Step 27 - Re-install all lower shields by tightening retainer bolts. Step 28 - Then, double check all previous steps to ensure proper installation. Remove the pump reservoir cap and refill with manufacturer's recommended fluids only. 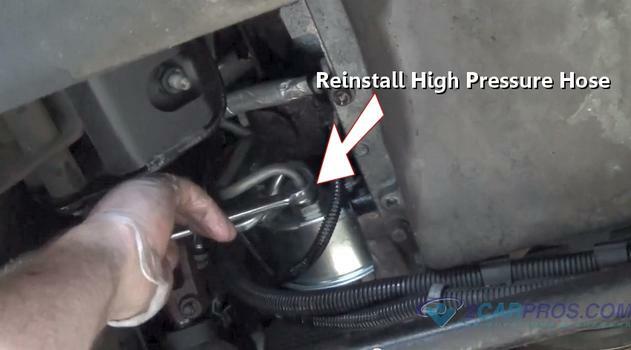 Step 29 - After adding fluid to the full line level on the indicator re-install the cap. 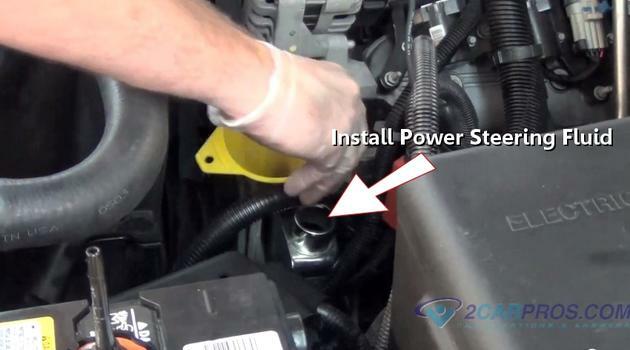 Next, start the engine and turn the steering wheel about a quarter turn in either direction to make sure the pump is operating correctly then shut the engine off and recheck the fluid level. 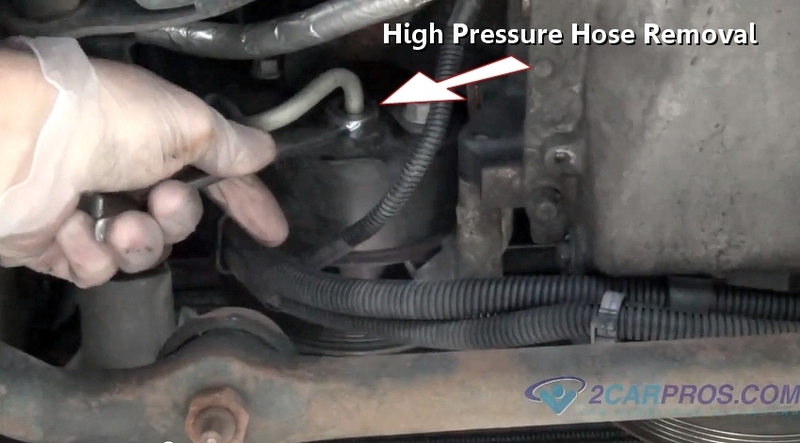 When refilling hydraulic pressure systems such as a power steering system its common for the fluid to become aerated. This condition with cause the pump to make a whining noise which will subside overnight. 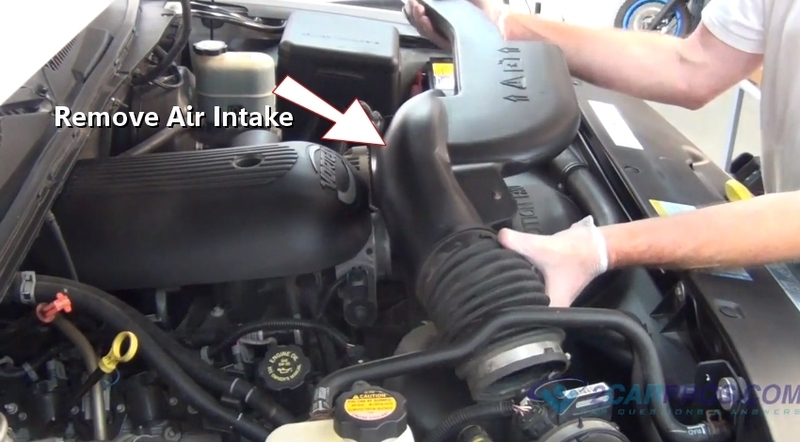 Once the air has dissipated from the fluid recheck fluid levels and add as needed.